I’ve spent 8 of the last 9 years at Deakin; the entirety of my tertiary education. In that time, Rod Snow and Andrew Dawson have been constants in my experience as an undergraduate, and now postgraduate student in exercise and sports science. This afternoon, it was wonderful to send them off onto their next adventures – Rod to enjoy a well-overdue gap year with his family, and Andrew to start his new position at Victoria University. But I can’t quite picture what the School of Exercise and Nutrition Sciences will look like without them in 2015. Brilliant to hear insights from Steve Moneghetti (@steve_mona) and have the chance to meet the great man. An icon in Australia, and rightly so given his remarkable contributions through his athletic career, his ongoing involvement in sport, and his passion for growing the people around him. 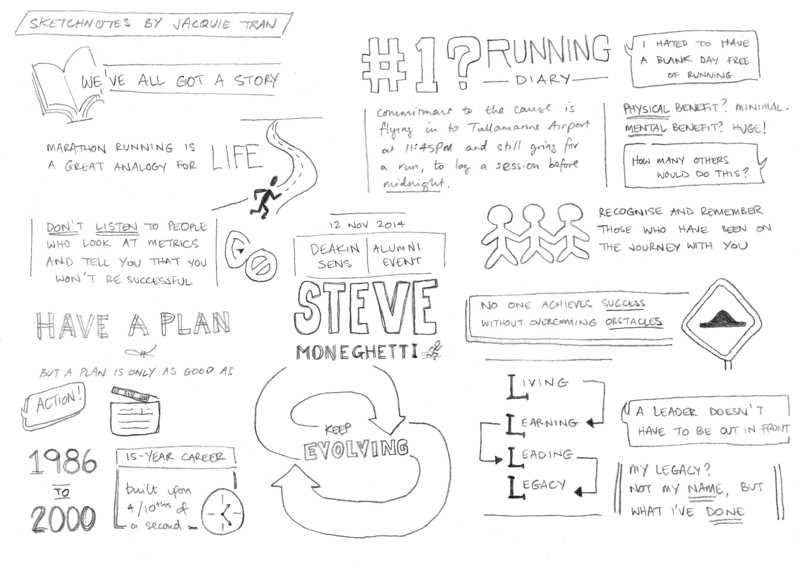 Here are my sketchnotes from Steve’s address at tonight’s School of Exercise and Nutrition Science Alumni Event held at Deakin University. On Wednesday 5th September, 2012, the Centre for Exercise and Sports Science (C-ESS) held a “Science in Football” symposium at Deakin University. The event brought together experts from a variety of disciplines and codes, to “talk shop” about how science is being applied in football, how it has transformed these sports, and the next frontier of challenges for sport scientists stepping into these environments. Ray Breed (High Performance Manager, North Melbourne Football Club) opened the event with his keynote address, and was joined by Tom Reddin (High Performance Manager, Melbourne Heart Football Club), Sarah Clement (Strength & Conditioning Professional / Exercise Programming Unit Chair, Deakin University), and David Parkin (decorated AFL Player, former Senior Coach…all-around AFL and Australian sport legend! ), with all taking part in a discussion panel later on in the evening. It was also an excellent opportunity for academics from C-ESS / the School of Exercise and Nutrition Sciences (Dr Paul Gastin, Assoc. Prof. Michael Spittle), and the School of Management and Marketing (Assoc. Prof. Pamm Phillips) to showcase the considerable body of Deakin research that is underway or has been completed within the football context. Quite something to see the breadth of work across such varied disciplines as skill acquisition and motor learning, training and competition load monitoring, elite sporting performance, junior sport and junior athlete development, sporting governance and policy implementation. Pleasing to see several of my current and former undergraduate students attending the evening, and hopefully getting a taster of the opportunities they can explore within the Honours program for 2013. Ray Breed spoke of the application of sport science in managing the players at North Melbourne Football Club, and how the evolution in science and technology has “levelled up” their capacity to monitor athletes and individualise their training and competition loads. Following on from Paul, Assoc. Prof Michael Spittle and Assoc. Prof. Pamm Phillips spoke of their involvement with research in football. I didn’t get any notes down, but it was great to get a feel for what’s happening just outside of my own sphere. As a PhD student, it’s easy to fence yourself in, so it’s always a welcome privilege to hear about the other innovative research that is underway within C-ESS. All in all a fantastic event, full of invaluable insights from those who are “at the coal face” and have first-hand knowledge of the unique opportunities and challenges afforded by the growth of sport science in football, at all competitive levels.